Should we not at least offer Ford a fair-market loan? Of the three, its handled adversity well and has a realistic plan for the future. It hasn’t begged for a bailout or anything close to it, merely a chance to get financing that in ordinary economic times it would be able to get on the open market. That the credit market is frozen (and will remain so for months to come, not just for Ford but for businesses in general) is not Ford’s fault. As well, I would prefer if GM and Chrysler go out of business, Ford should get first dibs on any firesale of divisions, technology or features (ala Onstar). The prospects of a $14 billion government rescue of the American auto industry seemed to vaporize Thursday morning as the Senate Republican leader, Mitch McConnell of Kentucky, spoke out forcefully against the bill, effectively dooming its chances despite the urgings of the White House. Among other things, the alternate plan offered by Mr. Corker calls for giving the holders of bonds issued by the auto companies 30 cents on the dollar to ease the companiesâ€™ debt burden; immediately bringing workersâ€™ wages in line with foreign companies like Nissan and Volkswagen; and forcing the United Automobile Workers to eliminate payments to workers after their jobs have been eliminated. Ford is interesting, because you have a company that may be the victim of others’ bankruptcies (if suppliers close, etc). A similar thing is happening in ethanol, where VeraSun’s (I believe the #3 producer) bankruptcy makes things more interesting for Poet (the #1 producer). Ford does not need government subsidies to survive. Chrysler is going down no matter what. This whole issue is about saving GM and the UAW without them having to make the kind of changes that they need to make in order to survive without massive and continuous government subsidies. I too want to see GM go down. I’m still pissed off about my 1978 Chevy Malibu. The bailout didn’t pass last night. I was kind of surprised. I read the Friedman Op/Ed last night and this post earlier this morning. It has had my spinning ever sense. Second:…the Friedman OpEd has me on tilt. There is another model! Fourth: Some of my earliest business memories as a kid is the decline and fall of the Milwaukee Road. One of my current co-workers worked as an engineer at the tail end. Five: Following the Wikilinks, I was surprised how much of the decline of passenger service was attributed to government meddling at all levels. But Ford does need a line of credit, as any business does at this point when the credit markets are frozen. I don’t think its wise to punish a company in the name of free markets when regulation failed, trust is frayed and banks aren’t lending near the amount they are supposed to be (and not near the amount they should be given how much money Bush, Paulson & Congress gave them via the bailout). I find this an either/or fallacy. There is a third way. We can help Ford by loaning them the money they would be able to get in any other economic climate via a bank. Or we can start fining banks that took bailout money for not lending money. I think somebody about to blink. He lives in a white house. I guess you might call it his “legacy cost”. The Milwaukee Road was big where I grew up. If people from NYC want to take the train to the Corn Palace, they could probably have it on the tracks by Friday. Or we can start fining banks that took bailout money for not lending money. That would be my preference. Actually, it would be my second preference. My first preference would be to do something like “flogging through the fleet.” Tie some bank officers in the back of a pick up truck, drive to a bank headquarters, order all the employees to come outside and watch, lay on several lashes, drive to the next bank headquarters and repeat. As encouragement for the others. Is there something I’m missing? During the election they were throwing around the word ‘socialism’ like it was a nasty imuno-virus but now all the leaders are talking about government being in the banking business, the credit business, the car business..does it ever end? Isn’t the whole point of capitalism that some fail and some thrive. i would never consider buying an American built car and it has nothing to do with Patriotism only smart purchasing. Japan makes better products at a better price. The Corker plan  — and perhaps targeted loans toward parts suppliers — would allow GM and Chrysler to experience the bankruptices they need without bailout out the UAW or destroying parts suppliers. 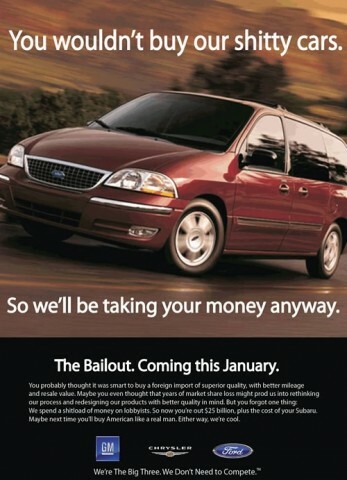 If Bush does use the TARP to bail out the automakers, let’s hope he is that wise. On the subject of your thoughts on personal transportation , the Chinese looks like they are a year ahead of the Volt in producing an electric car . I agree on avoiding negative halos in debt markets, but I don’t see how one that saves the industry that makes us the Saudi Arabia of oil, but does not similarly help ethanol, biofuels, wind, solar, etc., is good policy. Welcome to the tdaxp community! The love of socialism has increased a lot after the Bush-Pelosi bailout. If GM, Chrysler, and the UAW survive this in a recognizable form, it will set a very bad precedent for the American economy.